End of Summer Wishes to You! No ranting. Although, based upon the volume and almost universal support I received after the last enewsletter, it sounds like that’s a good “voice” to revisit! Today I’d rather share ideas stumbled across or thought of recently. We all know ideas are the easy part; it’s the execution that remains the key. Many of you have probably jumped on the “promotions” bandwagon, but if not, start jumping! Think contests, interactive content, database building, email marketing and revenue diversification. Each one would be worthwhile alone, but all are possible. What are you waiting for? Here’s a nice “rule of thumb” I attribute to Jason Taylor of GateHouse Media (thanks, Jason!) – the title sponsor (s) for any events you are conducting should cover all the event operating costs. Don’t be afraid to ask for that much! This next notion might not apply to the smallest markets, but assuming you have an email marketing list, send readers regular introductions to the members of your team. Not just your reporters and photographers/videographers, but press operators, sales executives, leadership, etc. The more “pErSoNaLiTy” your organization has, the more it can engage multiple audiences. I’ve noted the Dallas Morning News doing this and love it! If you’ve not heard of SpokenLayer, follow this LINK and read all about it. In a nutshell – SpokenLayer takes your content then automatically adds a “voice” to it for you + listening in auto = big opportunity. The traditional media world has a chance to l-e-a-d with this technology rather than trying to play catch up. Check it out! You probably caught the recent news that the number of national print advertisers declined by 13% between January and April. This has as much to do with the decrease in retail outlets as anything. However, it does – or at least should - focus attention on controllable LOCAL businesses! Those operated by decision-makers we can actually speak to and interact with and get a “yes” from. If we’re not regularly increasing our penetration of those with new offerings, then shame on us. There’s not a newspaper that hasn’t thought about launching or is well down the digital services path. As one element of a diversification strategy, I’m 100% supportive. Yet, I firmly believe there is TOO much hope and expectation of how much those will genuinely support your mission. However, the newspaper that figures out what might be called Advanced Business Services (ABS) will change the game! I see enormous potential in an ABS strategy because there are a host of potential partners ready to help execute and fulfill this vision. This is NOT an “invented here” possibility and the challenges to do it right should deter any consideration. If we’re just a teeny bit clever we can leverage our still enviable position. The opportunity is considerable and when structured right, will be recurring revenue! The “go to market” strategy is something like: For three generations we’ve helped our communities by keeping you safe and educated and informed; plus, connected shoppers and sellers via advertising. In the 21st century we can further advance our democratic obligations thanks to technology. 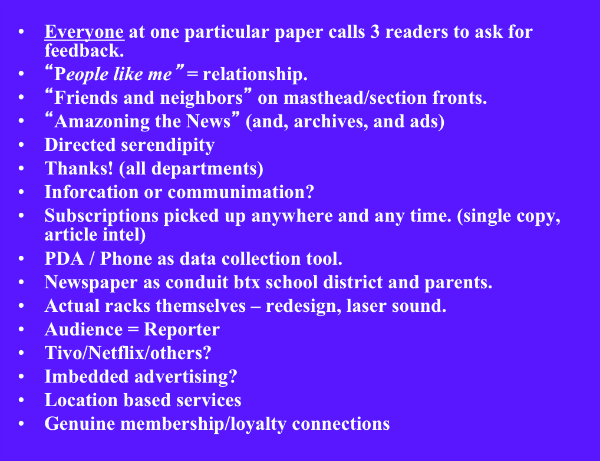 Local News Now (Newspapers 3.0) – Imagine the creation of local mobile and online portals that act like Next Door, but are entirely devoted (and controlled by) to specific local organizations or interests. Citizens can add content – educational institutions can communicate with parents, students, donors and alumni – not-for-profits can engage and involve their members – you can even serve as a crisis communications “line” that connects and coordinates your community in times of need. I can see a virtually endless list of organizations to serve no matter the market size - every bit of it content local audiences will find an interest in. ABS (Advanced Business Services) – Of course you will continue to distribute ads that speak to readers and web site visitors (and everything else you offer) plus the existing digital services that have become critical revenue streams. But, you can do more! Offer tools, technology and solutions to support your customers as they try to maintain and grow THEIR businesses? Doing so will allow you to increase your business penetration from the very low single digits to 20% or even 30%. Imagine dozens (hundreds?) of businesses paying a recurring fee to access things like online and mobile support tools that look like CRM, project management or even basic contact management solutions. By doing so, the trusted traditional newspaper can morph in to a trusted comprehensive marketing and communications solutions provider, as well. In even small communities there’s likely a million dollar opportunity with only average “penetration” – that has to be meaningful in today’s environment, right? Let me know if you’d like to learn more. Good luck out there! Let me hear your reactions, thoughts or condemnations.